The 18-member NSERC already includes another Harper government appointee, mathematician Christopher Essex, who wrote a book challenging the “myth of climate change.” On the same day Dr. Mullins was appointed to NSERC, April 23, another skeptic of global warming was appointed to the board of the Canada Foundation for Innovation, which funds large research projects. John Weissenberger is a close friend of Prime Minister Stephen Harper, a former chief of staff in the Harper government and a geologist who works for Husky Energy in Alberta. Dr. Weissenberger has written opinion pieces in the media and on his Internet blog expressing his “skepticism about global warming.” That and other comments by the two appointees on the public record were compiled by NDP researchers and verified by The Globe and Mail. Both Dr. Mullins and Dr. Weissenberger told The Globe and Mail they are well-qualified for the positions, and both said they have no intention of using the posts to advocate for reduced funding for climate science. While both NSERC and the Canada Foundation for Innovation fund some climate-change research, climate scientists are particularly concerned that their main source of federal funding — the Canadian Foundation for Climate and Atmospheric Sciences — will have to shut its doors next year unless it receives new funding. Prof. Clarke, who has co-authored IPCC reports, said “I don’t see anything wrong with putting a Fraser Institute person in there. 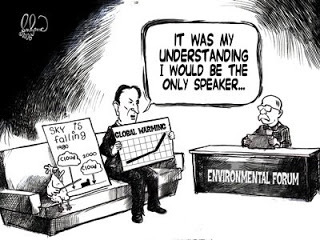 It’s just when there’s a sense that they’re going to stack the deck that it becomes problematic.” University of Victoria climatologist Andrew Weaver, another lead author of past IPCC reports, said politics should be kept at a distance from these boards. He also said it is “very disturbing” that people who dispute global warming are making strategic decisions on scientific research. “What would the public think if we appointed outspoken proponents of the fallacy ‘smoking doesn’t cause cancer’ as members of the boards funding medical and, in particular, cancer research?” he said. Bill Rodgers, a spokesman for Environment Minister Jim Prentice, declined comment on the individuals appointed. But he did say: “Since we took office in 2006, we have made no bones that climate change is one of the greatest challenges the world is facing.” NDP MP Bill Siksay said the appointments highlight the need for the Conservatives to honour their 2006 pledge to have federal appointments reviewed by an independent commission. “This is a requirement in a democratic society to have that kind of oversight,” he said.